Good Monday morning, my friends! I hope you are all having a happy and safe holiday weekend! Today in my seasonal calendar we are leaving Spring behind and diving deep into Summer - and what a morning it is: sunny and warm, with the garden all aglow and a-buzz. How I love this glorious time of year! For the next nine weeks I hope to weave as much summer joy as I can into our family life ... little traditions, easy activities and simple observations. To that end, I have assigned each week a theme, and created a new set of planning sheets - which you are welcome to use if you wish! Below are links to the PDFs of these sheets - please let me know if you have any trouble opening them. I will do a follow up post later this week to show you how I'm using these sheets in my daily/weekly planning - and expand a bit on the themes - but for now, I hope you enjoy ... and I hope you are all enjoying a lovely start to your Summer! "There is no lack of produce in August gardens, the best of which is saved for the fairs and reunions. Jars of golden mustard pickles and crisp green cucumber slices wait in rows in the cool cellar. String beans and corn relish are counted by the dozens of jars. Jams and jellies in sparkling colors await such special occasions. Herbs are hanging from the rafters in the warm, dry shed, soon to be pulverized for winter's use, but green herbs are plentiful in the garden for fresh salads: lettuce, parsley, tarragon and chives, savory, thyme and chervil. There is no lack of garden stuff for family reunions, no indeed. Even the tomatoes are ripe, the better to flavor a casserole of summer vegetables." "Summer falters. Mornings taste of autumn; evenings close in earlier, quietly, no longer filled with melodies of garden birds. Only the thrush may still be heard singing, or a robin calling. A cricket chirps at the door-rock and cicadas forecast first frost ("six weeks from the first song of the cicada"). Swallows gather on telephone wires and sweep through the late summer air to gather such feasts as they may. Elderberries and blueberries are dead ripe. Goldenrod lifts its fringed blossoms over the stone walls. Butterflies hover over the hollows and ditches where joe-pye weed blooms in soft purple drifts. In years gone by, to cure fevers tea was made from joe-pye weed and its sister plant, the white boneset. In the woods' damp shady places, Indian pipe rises in its ghostly white and we stoop to examine it in wonder and delight ... "
Well my friends, I hope you are all having a nice week. It's flying by is it not? Thursday already ... I am taking pictures right this minute (or in just a few) of my daybook's Thursday-Friday page so I can share how I'm using it. Really having fun setting up my lesson planner for the new year, too ... there's so much promise at this time of year! Thanks for stopping by, everyone ... see you here again very soon! How about some Midsummer News? I'm working on my Early Autumn notes just now ... so many notes! ... but I must remind myself to stop and savor the Summer before it passes ... time is a-flying as always! Blessings on your day, my friends ... thanks for stopping by and see you here again very soon! She has quite the green thumb as you can see! Also this weekend, I found these neat plastic page finders at Staples. (Ah, the siren's call of Staples at this time of year ...) I usually make my own out of scrapbooking paper, but these are quite sturdy and fit a 3-ring binder perfectly. I have one in my home keeping binder for marking my place in my domestic journal (my daily notes/clippings log) and another marks where I have current project plans. I also stick post-it notes to the page finder for various things ... but more on all this when I do my binder tour! A beautiful snakeskin found in one of our stone walls ... there's a garter nest in there apparently. I love how complete the skin impression is! Can you see the tiny eye marks? Speaking of nature, don't forget The Perseids are coming this week! (Actually, they're already here, but peaking around 8/12-13.) This annual meteor shower brings beautiful shooting stars to the dark night sky ... read more about them here. Ripe & In Season: Rhubarb Crisp! When I have rhubarb on hand, I usually make a "grunt," which is very much like a cobbler ... but as the recipe calls for whipped cream in the batter - and I had no cream in my fridge - I decided to try something else. Bill really loves "oat-y" fruit crisps (or "gluks" as his family calls them) and so I went with this one because it was chock-full of oats! Well my friends, thanks so much for stopping by - I hope you all had a nice weekend. And thank you again for your continued patience as my blogging rhythm stalls for a bit. 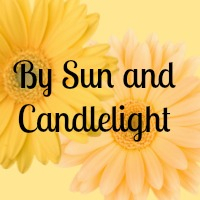 I am trying to find time here and there to blog as I can ... for instance, I thought I might post about my summer pocketbook next. I would love to talk "bags" - style and organization - as it's been a while since we'd chatted about that. How 'bout you? Would you care to share with my what your summer purse (tote, satchel) looks like this year? And what's tucked inside? 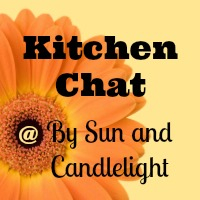 If so, feel free to email me a picture and your thoughts on summer bags (bysunandcandlelight AT comcast DOT net). I'll have a post up, hopefully, by the week's end. Enjoy your week, everyone - see you here again very soon! "If produce had a holiday, it would be August. All of August. There's just no better time to eat melons, corn, tomatoes, zucchini, peaches, and every other fruit and veggie you can pluck from your garden or pick up at a farmer's market ... Enjoy!" I was flipping through my BH&G, waiting for the oven timer to ring, when I came across this quote and I thought it quite lovely ... and so true! I was just thinking about our neighborhood farm stand and what might be fresh there this weekend ... I'm itching to make zucchini bread, and perhaps some peach butter. How do you take advantage of the bountiful produce at this time of year? Do you preserve it in some way or simply enjoy it fresh while you can? Perhaps you do a little of both? I haven't done much preserving myself, though some years I put up several jars of my grandmother's picalilli. That's a Labor Day family tradition I would very much like to honor this year! Preheat oven to 350 degrees F. Grease a shallow gratin dish or other baking dish with 1/2 tbsp. of the butter. Place 1 tbsp. butter and the olive oil in a skillet over medium heat. Add the onions, garlic, and green pepper; saute over medium-high heat for 5 minutes. Add the squash, corn, and salt and pepper; saute another 4 to 5 minutes, until the squash is nearly tender. Remove from heat and set aside. Mix together the flour, cornmeal, basil and/or thyme. Stir in the eggs, milk and vegetables. Spoon the mixture into the prepared dish and bake for 25 to 30 minutes or until a crust has formed and a knife inserted into the center comes out nearly clean. Dot with the remaining 1 tbsp. butter, sprinkle the cheese on top, and bake for 7 to 10 minutes longer, until the crust has browned slightly and the edges are bubbling and crispy. Serve hot or at room temperature. I will certainly be making this sometime very soon ... I will pick the basil and thyme from my deck and I'll get the rest of the produce at the farmstand down the street. And I'll see what I can find for local milk, eggs, butter and cheese ... I can't wait to try it! "Shop-Local Challenge Trickier than I Thought"
Well, my friends, thanks for checking in and leaving your thoughts if you have a chance ... I hope you all have a pleasant night! I have more skls/bnls chicken breasts in the crockpot today - which means more shredded chicken for salad, pizzas, wraps, etc. I'll keep my portion plain, since I'm pretty sure it was Bill's bbq sauce - or rather, the chipolte pepper in Bill's bbq sauce - that set off my crazy reaction. He's holding his own - still sneezing now and again, but also still acting completely normal otherwise (eating/drinking/playing, etc.). Hates the meds of course, but what can you do? But I love how we all flock to the learning room, whether we're learning or not. But really, when are we not? I had kind of been kicking myself (as I do every year) for not doing much with our large patch of lavender... but seeing how dearly the birds love it, I feel somewhat less guilty. Also, I wrote out a rather lengthy post on how I get ready for a new school year, since I've had a few requests for a post of that nature. Alas, I was on Benadryl at the time, so it needs a little polishing before it posts, lol. Well, I'm going to sign off now, my friends - I expect my older boys and Bill home any minute, and I'm sure they'll be eager for supper. I hope you all had a nice weekend ... and I wish you a lovely Sunday night. ... tied, dyed, rinsed, laundered and hung out to dry! Fyi, in case you've never done tie-dye before, here's how we do it. We used a "one-step" tie-dye kit purchased at Michaels (I think it was about $10, but I had a 50% off coupon) ... a few plain tees (I paid about $4 each, but they often go on sale) ... and some elastic bands, which most of us have readily on hand. My friend Beth who hosts an annual tie-dye party, sets up a workstation in her yard (beneath a tent on a hot day like yesterday!) and between dips in the pool, the kids set to work. Some of the dye is spray-on (see Bookworm's tee at right) and that's all it takes - you spray your design, let it dry and then "set it" with a 10-minute tumble in the dryer. The two shirts on the left were made by wetting the shirts and wringing them out, then twisting the cloth in a spiral and securing it with rubber bands. Next, the dye was applied with squirt bottles and then the bundle was wrapped in plastic wrap. Six to eight hours later (we left ours overnight), the shirts were rinsed out (till the water ran clear) and laundered in cold water. ... in a breezy window ... on a hot and lazy summer day. Busy here on the homefront ... but I hope to post again later today! So, I'm looking for a dairy-free, non-mayo based potato salad recipe. If you have one to share, please leave a comment below! Thanks in advance for any and all help ... and have a great weekend my friends! "It was hot and she did her housework early, then closed the windows and drew the shades as she had seen her mother do. When Joe came in from work, he remarked with satisfaction that their apartment was the coolest spot in town." Well it's going to be scorching here in New England today - again! I'm going out very early to do the food shopping and then we'll stay in, and try to stay cool. Thankfully, this heatwave will be brief, and we do have AC, so I really can't complain ... but I often think of my grandmother on days like these. She had such a knack for keeping her house cool, even on the hottest of days. My grandparents' house never had air conditioning ... they just relied on good air circulation, drawn shades and several well-placed fans. My brother and I often stayed overnight at my grandparents', especially during the summer, and I can't remember an unpleasant night's sleep. Gram's bedsheets were the coolest things you could imagine, smooth and so comforting ... with a light bedspread and a fan blowing, sleep was surprisingly easy to find. So with respect to the upcoming season - which brings heat and humidity to much of the country (and world) - how do you "beat the heat" in your household? How do you keep your home and family comfortable on the hottest days of the year? Do you have air conditioning in your home or do you manage using other measures? What are some of your "keep cool" methods? Summer's upon us and I'm thinking about how we prepare and adjust ... for both the pleasures and challenges of the season. So if you have time, please leave me your thoughts! And as always, I thank you ... and wish you a wonderful day! Talk About Tuesday: Summer Plans? I'm wondering what your plans are for your children this summer ... Travel? Camp? Classes? Whether you homeschool or not, do you make any formal plans for your kids' education/entertainment at this time of year? Or do you just take a breather and let learning (and living) happen as it happens? I truly savor the slower pace of summer ... I love seeing all that free space on my calendar! I appreciate the freedom to spend more time at home ... if we wish ... and I also enjoy the flexibility for family outings and road trips. But I also like to keep my kids' "wheels turning," if you know what I mean, especially when it comes to math and reading. Senior-to-be Bookworm will also work through a formal science curriculum this summer, but for the younger two, "summer science" will be all about nature study ... gardening, too. So what's up for your brood this summer? Will this summer be different from last? Please leave me a comment if you have time! It's going to be a great summer!